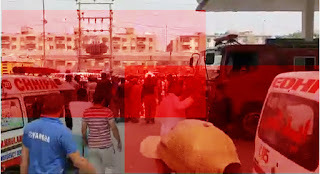 Karachi: A fire broke out incident is occur on Sunday 24th March 2019 in result of an blast at gasoline pump north karachi where one person's life lose while remaining no. of two persom became serious injured. After occurrence the said incident said people brought to Abbasi Shaheed Hospital for further treatment. Rescue teams and a Fire brigade teams suddenly reached at said above place of offence for control the situation.